Will I be fired for asking why I am not paid overtime as a Houston nurse? Technically, only your employer can answer that question. As experienced Texas overtime attorneys who see on a daily basis the frustration unpaid overtime can cause, we certainly hope that your employer would not send you permanently out the door for simply asking for an explanation. What we can tell you is that if your employer does fire you for asking about overtime, chances are they are breaking the law. The Fair Labor Standards Act requires that all non-exempt employees covered under the Act be paid one and a half times their normal hourly rate for all hours over 40 worked during one week. If you are considered exempt from overtime, your employer must give you an explanation on why they chose that exemption for you and also back it up with facts that prove you should be exempt. There are certain criteria that must be met in order for the exemption to be legal, but if even one requirement is only met a portion of the time, the exemption is void. Since even the U.S. Department of Labor believes that nurses are rarely exempt from the FLSA and, therefore, overtime, it is definitely worth discussing your situation with an attorney if you are a Houston nurse not receiving overtime pay. That’s where Kennedy Hodges comes in. We are available to analyze your situation in a confidential and complimentary consultation and will be happy to provide you with the tools you will need to ensure future overtime pay. Call us today at 888-449-2068 or fill out our online form, and we will also send you a free copy of our book, Ten Biggest Mistakes That Can Hurt Your Wage and Overtime Claim. I have left my Houston computer IT job. Can they withhold my last paycheck until I return my work equipment? According to the Texas Payday Law, an employer is not allowed to withhold a paycheck for work rendered, regardless of the amount or value of the employer’s property the employee is still holding. The only time wages can be withheld from an employee is when authorized by the law, when ordered by a court of law, or when the employer has written authorization from the employee agreeing to the deductions. The law also states that if an employer wishes to recover the property, business managers must do it through other ways: for example, by a lawsuit in small claims court, by contacting the police, or through an alternative arrangement with the employee other than withholding wages. If an employee fears she will have her check held without returning all the property, the employer is at a great advantage. Computer repair operators, cable installers, information technology specialists, and sales representatives are among the categories of workers who most often have disputes with former employers over business property. However, a Texas employer who withholds pay illegally can intimidate any worker in any job. If you believe you have had wages improperly withheld by your Houston computer employer, you should order your free copy of our book, The 10 Biggest Mistakes That Can Hurt Your Wage & Overtime Claim. You deserve to receive all the money that you have earned. If you are having trouble getting the money that is owed to you, you need to contact a Houston overtime attorney today at (888) 449-2068 for your free consultation. We are here to help and just a call away. Where can I go to get help if my employer is withholding my OT pay? According to the Bureau of Labor Statistics, nearly 250,000 people across the nation are employed by the oil and gas industry. Due to the often dangerous work conditions and amount of physical activity involved, these workers make a decent living with pay averaging $40.00 an hour. However, although their base pay is respectable, working conditions commonly require several hours of overtime each week (20 to 40 additional hours isn’t uncommon). Now, as an oil worker these OT hours shouldn’t be all that surprising. However, what is surprising is when OT isn’t paid, and unfortunately this happens a lot. Over the course of the past few years, the Occupational Safety and Health Administration (OSHA) has been focusing its attention on the oil and gas industry due to numerous accounts of overtime fraud. An agreement between OSHA and the Employment Standards Administration (ESA) has been set up to help delegate enforcement of the Fair Labor Standards Act in order to help answer workers’ concerns and investigate potential fraud. Unfortunately, the only way for OSHA and the ESA to receive legitimate information to investigate is by hearing from the employees themselves. However, many workers aren’t aware of their rights, don’t know where to turn, or don’t feel comfortable enough to complain without fear of employer retaliation; causing many incidences of OT fraud go uninvestigated and unpunished. Few things are more frustrating than having to fight for your rightful pay. In an ideal world you should be able to trust that your employer is working as hard for you as you are for him. Unfortunately, we’re not living in an ideal world. In this world, most people—including employers—care more about their own profits than how hard you work. Let us help you send them a message. Contact us today for a free consultation and see if you have a case to fight back. Our extensive knowledge with overtime fraud and payment withholdings will not only give you the confidence to file a claim, but will continuously give you the support you deserve to make your case. You deserve your wages, and we want to help you get them. My boss said I am an independent contractor and doesn't deduct any payroll taxes from my check, but I feel I am an employee - what do I do? I signed an arbitration agreement when I was hired. Can I still sue my employer for back wages? 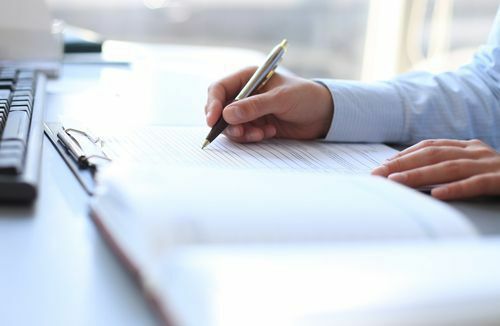 The rules on arbitration clauses have been upturned recently with a new ruling issued by the National Labor Relations Board. Many companies include arbitration agreements in employment contracts. These clauses usually mean that any claims you have against your employer must be settled out of court with a third party, not with a judge or jury. You also are not able to bring forth any collective actions. But a recent ruling by the NLRB can change that. The NLRB recently stated that these agreements may be invalid and that an employee’s right to join collective action lawsuits against their employer override signed arbitration agreements. Also, employers may be prohibited from having employees sign these agreements in the future. If you have a claim against your employer, but you signed an arbitration agreement, you may still be able to bring a claim to court. Contact our employment lawyers for a free case consultation. You can call our office toll-free at: 1-888-449-2068, or send us a confidential contact form. Read the full article: New ruling says you can sue your employer, even if you signed an arbitration agreement. I received a letter relating to the Halliburton settlement with the Department of Labor, what should I do next? According to the U.S. Department of Labor, oil and gas employer Halliburton illegally compensated over 1,000 of its employees when it misclassified them as being ineligible for overtime wages. The finding comes after an investigation that is part of an ongoing multi-year compliance initiative by the Department of Labor. As a result of the Department’s discoveries, Halliburton has now agreed to settle for approximately $18.5 million. Consult with an experienced attorney. While it may be tempting to simply accept the settlement offered with regard to the unpaid wages you rightfully earned, doing so could mean that you receive less than you really deserve. Halliburton has a team of lawyers at its disposal to deal with these claims. It is crucial that you level the playing field by having a professional in your corner. Assess the amount of unpaid wages that you believe you are owed. If the settlement amount is less than this amount, which it likely is, you may wish to consider how next to proceed. Gather any documentation relating to the hours that you worked, the pay that you received, and the responsibilities of your job. Many employees are entitled to overtime pay under the Fair Labor Standards Act. However, there are some exceptions to this rule, though the exceptions are limited. Gather any communication between yourself and the company or the company’s attorney relating to the settlement. It is important for your lawyer to understand what has been said to date as it may impact your legal claim. Determine whether to accept the amount offered to you or pursue legal action against the company. While pursuing legal action may have higher upfront costs, it could potentially result in more money in your pocket when the action is over. When you are ready to take action with regard to your wage and hour claim, we are here to help. We encourage you to reach out today for more information at (888) 449-2068. Do truckers get paid overtime if they work more than 40 hours a week? The amount of "down time" the trucker experiences (i.e. being stuck in traffic, sitting at the loading dock, etc.). It is important for all truck drivers in the state of Texas to remember, however, that just because you are not receiving overtime pay does not mean that you are not entitled to it. As a trucker, the best thing that you can do for yourself and your family is to talk to an experienced overtime wage lawyer in Texas and explain your specific situation to ensure that you are being properly compensated. The lawyers at Kennedy Hodges, L.L.P. will not only answer your questions and give you a full evaluation on your claim to overtime at no cost to you, but they also will provide you with a free copy of their book, Ten Biggest Mistakes That Can Hurt Your Wage and Overtime Claim. Simply call 888.449.2068 to be directly connected with an attorney. I recently stopped working for my employer and received severance pay. Can I still make an unpaid wage claim for overtime I never received? Yes. Even though you signed a contract to accept severance pay after you ceased working for your employer, you still may be able to file an unpaid wage claim if your employer violated the Fair Labor Standards Act. While severance pay is usually given to those who are laid off or retired, an employer may also extend the pay to those who were fired or voluntarily left the company. Packages usually consist of payment for years of service, unused vacation or sick time, health benefits and 401k payments, but vary from company to company. One mistake that many employees make is assuming that their employer's unfair wage practices should go unnoticed or unreprimanded just because the company gave a decent severance package. This is especially true if the severance package is offered as a way to cover up the fact that the employee did not receive overtime or fair wages when they should have. Unpaid overtime can accumulate a number of ways, but most often happens when employees are misclassified as exempt from overtime under the FLSA, or not paid for mandatory work times that happen to be off the clock or outside of the office - tasks like attendance to company meetings or travel time between work sites. If you are no longer with your company and are receiving severance pay, but still feel you should be compensated for unpaid overtime, contact the Texas overtime lawyers at Kennedy Hodges for more information. In addition to providing you with a free copy of their book, the Ten Biggest Mistakes that Can Hurt Your Wage and Overtime Claim, they will also sit down with you - for free - to evaluate your case and discuss your options. Protect yourself by calling them today at 888.449.2068 or by filling out the online form to schedule your free case evaluation. I provide in-home care for elderly patients, but my employer tells me I am exempt form overtime under the companionship exemption. Is this true? Home health workers provide important services to the elderly and infirm, but currently, many home care providers earn less than minimum wage and no overtime pay. If you work as a professional in-home caregiver for a healthcare company you may have heard of the companionship exemption under the Fair Labor Standards Act. In 1974, the FLSA was changed to include an overtime exemption for domestic service workers, but this also created the companionship services exemption, exempting in-home care workers from receiving overtime pay. This is an exemption that many home care workers are classified under, yet it is not necessarily applied correctly. Congress recently proposed a change to the law and if enacted, the proposal would extend coverage of minimum wage and overtime pay to professional caregivers. The proposal would cover almost 2 million in-home caregivers. Call our employment lawyers to determine if you’ve been misclassified in the healthcare industry. We have represented many clients, including nurses, in wage and overtime claims nationwide. How should I set up my workweek in order to properly track my OT? Does your pay seem small considering the extra time and work you put in at the oil fields? Do you feel as if the more overtime you work, the less you’re getting paid? Your employer may be intentionally withholding or miscalculating your rightful OT pay in direct violation of FLSA rules. Although you should be able to trust your employer to pay you fairly, many industries will do whatever it takes to increase their profits—including stealing from their employees. According to statistics taken from the United States Department of Labor (DOL), investigations into the Texas oil industry’s disregard for The Fair Labor Standards Act (FLSA), has initiated over one billion dollars in overtime back pay for oil workers over the past two years. The DOL’s Wage and Hour Division is continuing its investigation into the oil industry across the nation, but considering its findings so far, don’t you think you should keep track of your hours, just to make sure you’re getting what you’re truly owed? 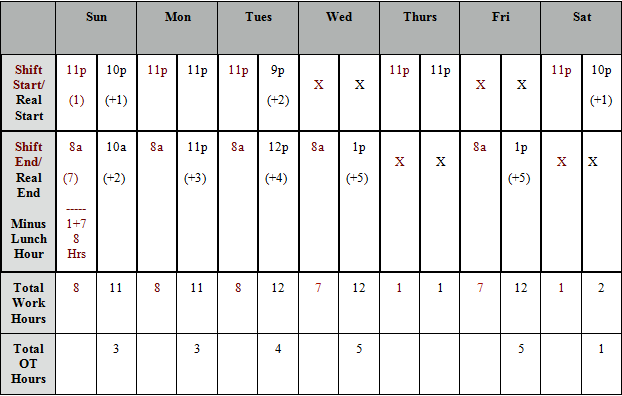 Make a grid schedule and label the columns with the days of the week, starting with the beginning of the pay week. Label rows for potential start times, your actual shift times, and a row for potential end times. The final two rows should be dedicated to your total daily work hours and your total overtime hours. Once you have the grid set up, you can then manually enter and keep track of all of your regular hours per week, as well as any and all overtime you accumulate. As long as you accurately calculate the math—which should be significantly easier if you don’t have an overnight shift—you’ll be able to easily tell how many overtime hours you work each week. This schedule shows 40 hours regular hours and 21 OT. Personally tracking your hours is a good practice to get into in order to check your pay. However, what happens when your numbers don’t equal the numbers on your check? Should you just let it go, and assume that your math was wrong? Of course not! You worked for that money, you deserve your pay. If your employer is withholding overtime pay, or you feel that he is misrepresenting your OT hours, contact us today for a free consultation. The FLSA entitles you to fair and accurate overtime wages, don’t allow a miscalculation (accidental or otherwise) to keep you from getting your hard earned money. Our extensive knowledge and experience with overtime law can help you understand your rights and make your OT count. Call us today to make your employer pay. Did you find this article interesting and helpful? Let us know by liking us on Facebook, or sharing this page with your friends, family and coworkers.